I hope everyone had a great weekend! My heart goes out to the families and victims of the Las Vegas shooting. Please take a moment of silence before you continue reading this post. This week, I have chosen to do a vegan coconut cream pie recipe. 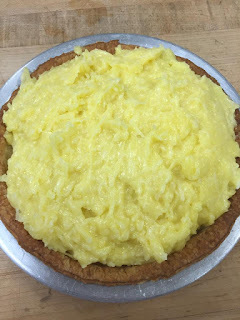 For a typical filling for coconut cream pie, it would have the half-and-half, and eggs. That's pretty easy to substitute. For half-and-half, we can substitute with coconut milk (seems like a perfect substitute). For eggs, just like for that pecan pie recipe, we will use SILKEN tofu. I want to make sure that I continue to stress the importance of silken tofu for baking/pastry items. Some people will use meringue for the coconut cream pie as a topping, but I just use regular whipped topping just because it is less time consuming. 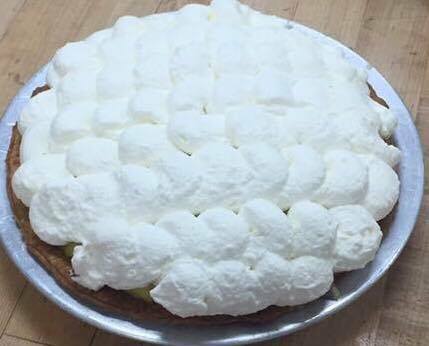 (Vegan whipped topping: I have a quick 4 ingredient recipe for that as well).Now, my opinion of the pie. I honestly really liked it, even with the tofu. I am always worried about tasting tofu in the dessert when I make it, so I usually add more shredded coconut, just to make sure I taste the coconut. I also add coconut extract to the whipped topping instead of the vanilla extract to give it that extra coconut flavor. 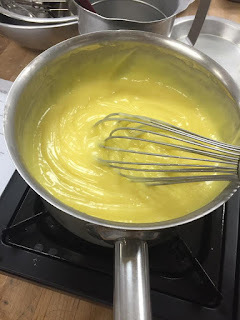 When you guys are creating the filling for the coconut cream pie, it is imperative that you are constantly stirring this filling, otherwise, it will coagulate and it will just be gross and dense. Don't plan to leave it unattended!!! Also, when you are done cooking your filling, make sure that it cools fully before putting it into your pie crust. The best part about this recipe is since it is a "stirred custard" pie, it does not need to be baked in the oven. You just need to bake the crust, you cook the custard, and then you just put it in the fridge until it is set, then you can enjoy this yummy treat! I am super excited to be sharing this recipe with you guys, and I am blessed to be part of this great blog. October 1, 2017 marked 1 year that The Smoothie Vegetarians have been up and running, and it is amazing on the progress we have made. Thank you all for reading! I will see you guys next week! Carefully work the water into the dough. (pour in some of the water, and start to mix it with your hands). This recipe is good for 2 pie crusts. So cut the ball of dough in half. In a saucepan, over medium-high heat, mix the sugar, cornstarch, and salt. Stir in coconut milk. Once it starts to bubble up, reduce your heat to low. Once it starts to thicken, remove it from the heat and allow to cool. Add silken tofu and the mixture to a food processor. Pulse it until smooth. Add coconut extract, vegan butter, nutritional yeast, and 1 cup of coconut flakes, and continue to pulse. Pour into your pie crust, spread it evenly, and then add your whipped topping (or meringue) to your pie, spread that evenly on top, and put it in the fridge for about an hour or two to let it set. Toast the remaining 1/2 cup shredded coconut. Top your pie with the toasted shredded coconut. Throw all your ingredients into the blender and blend it until smooth. Put it in the fridge for about 25-30 minutes to let it set. If you like it enough, you can always make them into tartlets!!! 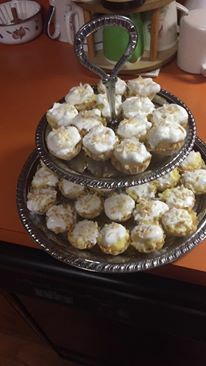 I have added an additional picture from when I made some tartlets for a bridal shower! This sounds delicious and I love that its vegan friendly. The bite size cupcakes would be dangerous for me. Ooh, I love custard. Not sure about replacing the eggs with tofu though. Will definitely give it a try next time I've got some vegan guests over. This sounds absolutely delicious! Will have to try out the recipe soon! Never even thought or heard of such thing. but it looks amazing ! These sound delicious but I'd worry I'd eat them all in one sitting! I was very interested to see how this was going to be vegan. I have never made a cocout pie to begin with. Always interested in how to dress up tofu. Yes yes yes! Coconut is my weakness. Love this recipe - gonna try it out on the weekend! This sounds delicious! I'm always down for coconut ANYTHING! Wow!! This is new to me. I really like coconut. and this sounds so delicious and tasty. Will try this soon. That looks delicious. I am a texture person, so I don't typically like tofu, but I do appreciate when people don't tell me exactly whats in what I am eating haha I get tricked into trying new things. This way I don't have any preconceptions about what I am eating. I can totally understand the tofu scenario. I am also a texture person. The glory of using the tofu is that it is pureed to the point to where there is no weird texture issues. Now, if that is still a turn off for you, I have another recipe that does not require tofu. It doesn't really taste the same, but it can still be equally as good! This looks delicious. This would be perfect for the holidays and I love that its dairy free.